Over the years, the O Music Awards have played host to world-record setting efforts like Chiddy Bang's 9-hour, 16-minute freestyle and the Flaming Lips' superhuman eight-show effort. 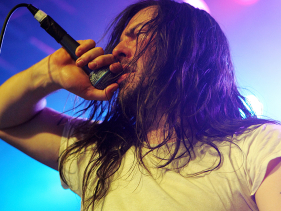 But both of those endeavors pale in comparison to what profound partymeister Andrew W.K. has in store for Wednesday's O Music Awards, where he'll attempt to set a new (and very specific) world record of his own: Longest Drum Session in a Retail Store. Yes, for the duration of this year's awards — 24 hours (!) — W.K. will man the kit in Oakley's flagship Times Square store, being joined by the occasional surprise guest (the Roots' metronome ?uestlove will serve as his co-pilot for the first leg of the journey). But mainly, he'll be going it alone, and, as he explained to MTV News ... he's actually slightly terrified about the task at hand. "Despite my apparent confidence, inside I am actually a very small, trembling shell of a person, who is not only intimidated, but completelymortified and horrified by the ramifications of this challenge," he said. "When I signed up for it, I was like 'Alright, 24 hours of drumming!' and then it started to set in: 24 hours of drumming. Just drumming for an hour — just drumming for 24 seconds — can be quite intense ... I can't even play one of my own songs on the drums all the way through without my arms burning. "So let it be said, I'm not taking this lightly," he continued. "I think it will push me to the very lengths of my strengths." Hey, no one ever said setting a world record would be easy. Meanwhile, as W.K. mashes, the O Music Awards' first-ever "Live Music Day" festival — featuring more than 50 acts, including Hanson, Kat Dahlia and Kate Nash — will be in full swing. And today, we've got a brand-new name to add to the event: the Jonas Brothers, who will help kick the day off with an exclusive performance! Yes, Kevin, Nick and Joe will help kick off "Live Music Day" with a performance that's set to feature a medley of songs off their highly anticipated fifth album, including new single "First Time." It all begins Wednesday, June 19 at 7 p.m. ET/4 p.m. PT atOMusicAwards.com!